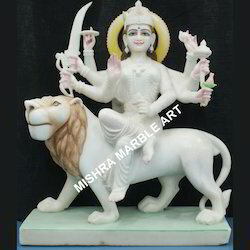 We are a leading Exporter of marble pooja thali, ambe mata statue, marble ganesha plate, marble puja thali and ganesha marbles art from Jaipur, India. 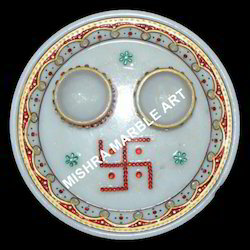 We are manufacturer of marble decorative pooja thali, pooja thali with kundan work, pooja thali painted, pooja thali with diyas. We offer an exclusive range of Ambe Mata Staute in white marble. 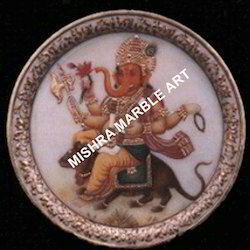 We offer an extensive range of Ganesha Marble Plate to meet the demands of our customers. Our organization offers a wide range of Ganesha Dish to our clients. 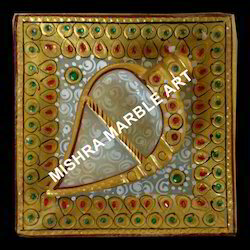 These are crafted out using high quality white marbles and advanced technology. This marble dish is decorated with intricate floral designs that enhance its appeal. In this dish, lord is shown sitting on his vahana, the mouse. Further, our range is ideal for gifting purpose and for home decoration. Looking for Other Products ?